$175,000? Take off a zero (or at least divide it by 5) and then maybe it will sell. "special Courier delivery...no transportation fee...???" "personal delivery service in red dessous black stockings and singing santa claus ???" I just seen this auction up on ebay and was about to report it with the link. "Special Delivery" should mean a six foot tall redhead (hopefully female)wearing a Santa Hat and not much else. You're right about one thing though...If this is an unregistered Apple I thats been sitting somewhere without someone knowing about it, it could be worth a pretty penny, but NOT $175,000.00. such a funny posting, appears that something is leaking on its logic board, and they have not powered this on, who knows if it works or not, Almost like selling a cookie that has been in someones mouth saying someone famous bit into the object. id give them $25 for the thing. no closeup photographs "gimmick" to startup... without frying some electric.....??? no serial no. : to make the story reliable and proof....??? it´s like painting the comes "out of the barn" and you can´t proof it to be fake or real... ??? and again back to the text "more Photos on demand...." - at the one hand they want 175.000 bucks - at the other hand they are to greedy to pay some 10 bucks more for several more photographs in the bid ... ??? are they delivered by the girl from Las vegas with a "Tabledance" - hoping to make you such crazy, that you press the "bid" button ???? and last not least "carensblablaauctions" which means, that the owner pays double priced a provision to caren and another provision to ebay... how studid must a seller be ??? Well I'm surprised no documentation for a 175,000 sale. With documentation it could be worth somewhere up there. As you know the value of something is dependent on what someone will spend. It has the specific things that mark it as real or someone spent a great deal of time/money copying this. As part of my second mimeo build I can tell you finding the video adjustment pot that was used on the real Apple I is near impossible, this one has it and the White 6502 and gold LM323k are hard to find but not impossible. I didn't see any pics of the bottom of the board.. That is the way to tell. The wave soldering did something funny to the Apple I boards in the area of the voltage regulators on the bottom. I'm not sure if you could reproduce that even wave soldering it today as you'd need to match the conditions and materials perfectly. Also compared to a real Apple I, the Mimeo has the Willegal.net logo and the Obtronix has traces that are too "rounded" on the front (don't know how else to explain, but they don't follow the same path and shape as a real Apple I). Also the Mimeo green conforming coating doesn't really match an Apple I.
I'd say this was a dealer who got lucky at an estate sale but doesn't have the docs. He may have to settle for less or try to document the board before finding a seller. One thing I noticed is the signed Apple I Manual. They happen to have these for sale at the "Signed By Woz" site, with a COA to go with it for about $45.00. If this is any indication, then I'd begin to worry about the rest of the story that is used in the description. I've been considering finding out about the owner listed in the story. He was supposed to be a programmer at Apple, but in all of the books I've been reading lately, I have not come across his name anywhere. and in the next days some answers will be given.... for example to the question on the case or the question on the "puchase-button" at ebay.... and just if some question are left in the next time without reply ... the world will still turn on... and we´ll view such sitcom movies at ebay and /or sothebies within the next years several times... that´s for sure ! I recall following three Apple I ebay auctions on AppleFritter in the past few years. IIRC, the first one sold buy-it-now for @ $17,000, second one sold, at auction, for $50,000, and the third one sold, at auction, for @ $24,000. Armchair appraisal for this one--value $75,000--eventually sells, at auction, at a steal, at $52,000. does everyone forget that it took two bidders to get the Christies unit to up over 200K (unless they had a shill at work). Personally I like this unit better than the Christies unit - that case is unique and the motherboard hasn't been hacked on. If the story is true about the guy in the posting and he was an early Apple employee you may be right and this may be an early Apple II case prototype that was lying around and he used it for his Apple I when the case was discarded. I could easily see something like that not going to waste and being re-sued. BTW: Everyday this posting gets better with more info, for 170 thousand dollars this posting should have been complete to begin with. I'll bounce the enclosure question off of some people that should know and let you guys know what I find out. What's the Christies unit? Do you have a link for that? It sold for more than $200k? Wow, prices are all over the place. Was there something significant about that one? The missing RAM is a bummer. You can certainly replace it with some 1976 MK4096's and it'll be good as new, however the missing documentation is a real problem. The case is sweet though, I'd love to know the story behind that. Is it the same unit? The first one we watched went for $16,000 buy-it-now, it says on that thread. The 766 repeat can't be a coincidence. The same bidder must have placed the last outbid bid. I'm guessing for this current auction, the seller is aware of the Christies sale and is trying eBay first to bypass the Christies commission (which would be how much? ), and if it doesn't sell on eBay, he'll turn to a New York auction house. Ok, all you with those Apple I's in your closets, the bar has been set. The first feedback I received is that he enclosure is probably not associated with any Apple product. It seems a Zaltair : )!!!!! Woz was one of the people I asked. I do love the fact this eBay posting keeps getting changed. More pics now... These closeups are really going to help me on Mimeo #2.
i´d guess probably not the last.... just by the way if it isn´t set back to ebay - how much will ebay charge for this attempt ? I had an Apple One and was looking at buying another on Ebay as well as an investment. It is different to the one i have and mine is original, I know that for a fact. It actually looks like the mimeo replica...IS IT? I don't know about computers much although I have a few online stores now. I was concerned that it wasn't original as the components were different to mine. I actually found a second Apple One in Canada and purchased it, real cheap! I was lucky the seller did not even know what the board was out, He had it advertised as old apple computer board. I received it five days ago and it is identical to my first Apple One and it still has me wondering is the one on Ebay original ? Can any one help me, I live in Australia and love to chat to her again about her board if i was sure it is original. Does your Apple I have an NTI logo on it under the Apple Computer 1 logo? I expect it does. 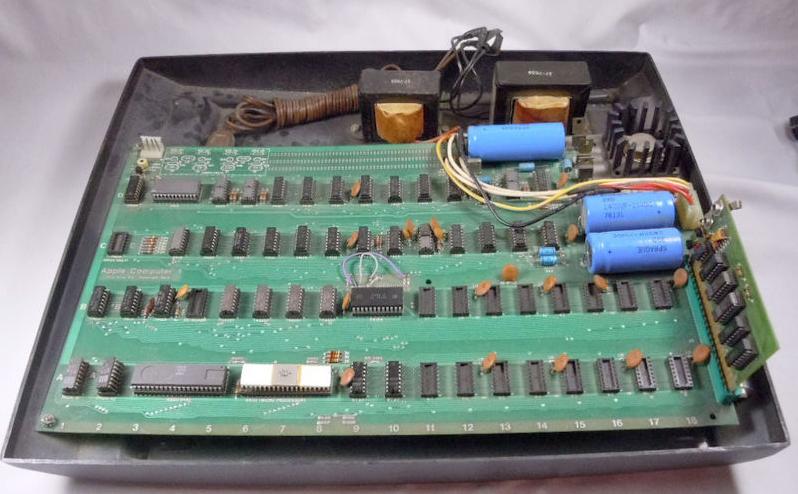 This one on ebay was a pre-NTI board, they were made in batches, and the pictures look correct for one of those boards, however it is missing parts, has a broken edge connector and needs a lot of restoration or care. The board itself looks un-molested by modifications which is a very good thing. Congrats on your Apple I find, post some pics of your board to a new thread, we always like to see and document a new board here !!! Not sure I believe this story about the multiple apple ones you have acquired. Not to be argumentative, but can you tell us more? The difference is in the detail between any Apple 1 replica and an original Apple 1 board. The Mimo board is not an exact copy of the Apple 1 PCB, board color, different IC's, the date on the components used, there are other differences if you compare the boards side by side. If you examine originals they begin to have tell tale fingerprints to them, look at the soldering on this board. The case was probably a one off or low volume unit produced at the time when most computers came simply as boards. It may have been originally intended for a home built terminal attached to a television. With the Apple II you could buy this just as a printed circuit board and people would fit them into whatever cabinets they could afford or had access to. The easiest way to check for a Mimeo is to check the back lower right hand corner. There are no smiley faces or URLs on the real thing. Even when you do see a Mimeo with the exact same IC sockets (which were really hard to find, since the Mimeo normally uses much better quality sockets than the real Apple I), you can notice the color is off for the "green" coating. Also the Mimeo boards are not 30+ years old so they look new, aging the board would not be so easy without actually damaging them. I can see that the cassette interface in the Apple 1 is mounted in the wrong side : ). So I'm reviving this thread just to add some color, I was doing a search and this thread came up and I realized you guys might be interested. I got to work on this board earlier this year. The case was actually a thin plastic top terminal case. The keyboard was cut out poorly and the stiffener removed from the datanetics keyboard. Then rivets were used to secure the keyboard using scrap plastic from the cutout. I don't recall if I publicly posted the pic,but I had to repair the edge connector and there were a few dead chips. More on the case... There was no power switch only a lamp cord and plug. There was also minimal ventilation, so this machine did not run for long periods of time as the LM323k would have gotten very hot. The screws were very heat cycled. I'll try to post some pics tomorrow. I'm on my iPhone right now and have to pull those up on my Mac. Well I worked on this one a while ago, so I only have some pics I took myself back then. It's in a private collection right now. I don't know if owners plans on it ever coming up for sale. Not everyone who contacts me to get a machine running is an auction house. I do get private collectors who want it for themselves... and for the record... Not every machine I get running is an Apple-1. I do enjoy other vintage computers I even decided for VCF East this year to not do anything Apple. Picture of the split edge connector. This is a very early Apple-1 since the edge connector is in backwards. Some of the very early Byte Shop boards are this way. And the Datanetics keyboard being cleaned, notice no mounting brackets and stiffeners. The connector also was cut to allow it to fit in the case. I have video of the system running, just don't know if I'm allowed to share that.